That title makes roundabout sense. I’m witty today! I’ve always wanted to try out the Gear 360, a camera that can take 360-degree images and movies that can not only be viewed on your phone, but – for lack of a better and more grammatically-correct phrase – ‘spun around in.’ I recently had a credit applied to my Samsung account that made the normally $200ish camera $99, and I couldn’t pass it up. Just to be clear, we are talking about the newer version, which looks like a ball on top of a little post, not the first version which looks like a golf ball on a tripod. After returning the first one because it was clearly a used item, the new one finally arrived. I was eager to try it out but had to charge it first, which took some time. The camera itself has a rounded top with cameras on both sides of the golf-ball shaped and sized head. There is a small screen on the camera that provides various bits of information, such as battery level, resolution setting, and so on. There is a power button on the side and record button on the front (The camera is symmetrical, so I’m calling the side with the screen the front, and the side with the power button the back; completely arbitrary). A second button on the side will pair it with your phone, and the Bluetooth pairing needs to happen before it will send images to your phone, obviously. You can also store images on an SD card for download later. As for compatible phones, either Samsung or iPhone; I have a Galaxy, and I have heard it doesn’t work so well with others but I can’t confirm that. I started with a shot of my office, hoping to see great things, however even though the 360 touts itself as a 4K-capable camera, the results were anything but that, and moving on to some shots of the campus didn’t change anything. Before I show some examples, I should also mention that there is really no way to view them other than on your phone, or by using very specific websites. I can’t just upload them here and expect them to work, I have to have a dedicated WordPress plugin to get them to show properly. In Microsoft’s OneDrive, the picture shows as a flat image that appears clearly warped, while in Google Photos it’s recognized as a 360 image and displayed as such (Direct link to Google photo sample here, you’ll have to click on the little circular arrow in the upper right-hand corner to switch to 360-degree view). OneDrive version is below. The pictures are easy to take, and you can do so remotely via the app or from the camera itself. In fact, in the Google version of the above image, if you look closely down the line of the brown trashcan the camera is sitting on, you can see me behind the lattice taking the picture. There are other settings you can adjust as well, and although the pixel count of the images is huge, 5742 x 2736, the quality just isn’t there. From a distance images look good, and when viewing on a phone they’re definitely passable, but upon closer inspection details are washed out and fuzzy, with lack of detail prevalent throughout. Contrast is poor and edges lose focus. Colors can be good, but are often faded or diluted. Note, for example, the purple trees in front of the building: The color is washed out, as is most of the image, and the detail is terrible. Overall the image conveys what it represents, but it could be so much better. I adjusted many of the settings but was unable to increase the quality of the settings in any meaningful way. 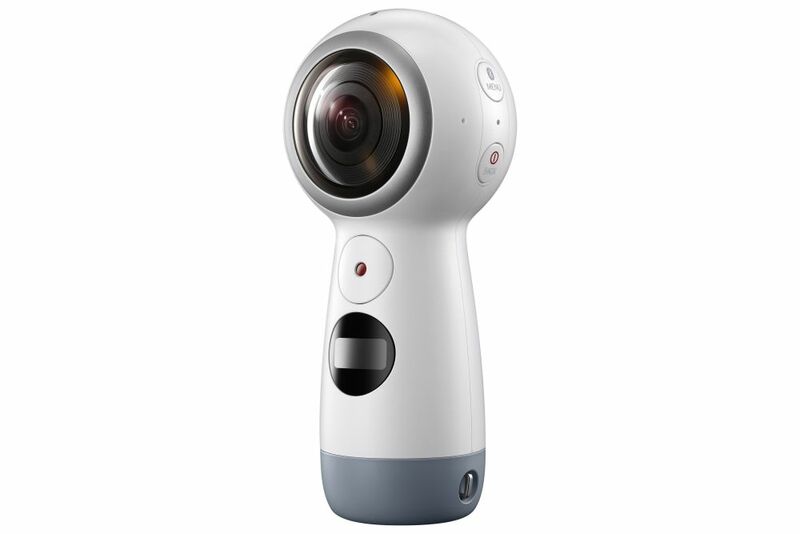 Strangely, the newer version of the Gear 360 actually has a lower resolution camera than the original model, and significantly so: the original had 15 megapixel cameras while the newer model, the one I’m testing, has 8.5 megapixel cameras. That’s a reduction of almost half. I also haven’t yet had the opportunity to test the video, and I will post updates when I do. Speaking of the significantly lowered resolution in the cameras, it takes proper 4K videos (4096 x 2140 at 24fps, which is the theater standard for 4K), while its predecessor took what is known as UHD video (3840 x 1920 at 30fps, which is the broadcast standard for ‘4K,’ but is not true 4K). It also has a lower capacity battery as opposed to the first generation Gear 360, 1160mAh v. 1350mAh (milliamp hours), however without knowing the specific power draw of the device I can’t calculate how many hours that translates into. The standard is mAh / draw = total hours of power. I’d guess around an hour, although in my tests on campus and around the house I had plenty of battery life left even after shooting a bunch of pictures, transferring them, and so on. So, it’s good but definitely not great. I don’t like the downgrade in so many of the specs from the first generation of the device; it’s like when the clock would tick backwards in school before the bell finally rang for recess. I know something good is coming, but the Gear 360 is at once a step forward and a step back. If they can improve the quality of the images for viewing at a larger scale, then they could really have something here. And it’s not like there isn’t competition: The next most popular would likely be the Ricoh Theta, which, from what I’ve read, bests the Gear 360 in almost all aspects, but I have no hands-on experience with it. I’m also using this post to test the plugin for 360 images, and I’m putting all the ones I took below (you’ll have to click to open them up) – let’s see how it does! Update: How strange. In order to embed the 360-degree images, I installed a plug-in called WP Photo Sphere that works by inserting a shortcode of the form “sphere 1234” in square brackets. In a test post that has nothing but that shortcodes, it worked perfectly. In this post, they don’t work at all, at least on my machine. I have no idea why, I’ve been investigating for almost a week but I will keep looking into it. It’s a nifty feature when it works. Update 2: Apparently all I had to do was make the page live. When published, everything worked fine. I did nothing, but I will take all the credit for it. Sweet, sweet credit.